Rumors surrounding a completely wire free next-generation iPhone continue to proliferate, with Foxconn now said to be testing wireless charging hardware that might see implementation in Apple's 2017 smartphone flagship. Citing sources familiar with Foxconn's operations, Nikkei on Monday said the Apple contractor is producing batches of wireless charging modules for integration with next year's 10th anniversary iPhone. Whether or not Foxconn's charging component will make it into the 2017 iPhone remains unclear, as the company is still working to boost yield rates to satisfactory levels, the source said. Apple ships tens of millions of iPhone units every quarter, and next year's version is expected to see unusually high demand thanks to a hotly anticipated design refresh. Nikkei's report suggests wireless charging could be limited to a high-end premium model, reiterating rumors that Apple plans to reserve cutting edge features like OLED technology for a single top-of-the-line 5.5-inch flagship device. Last week, the publication issued a questionable report claiming Apple would add a 5-inch iPhone option in 2017, positioned between the 4.7- and 5.5-inch formats introduced with iPhone 6. Those claims were subsequently debunked by AppleInsider sources. Apple has for years been rumored to integrate wireless charging systems into its smartphone line, but the technology has yet to materialize. 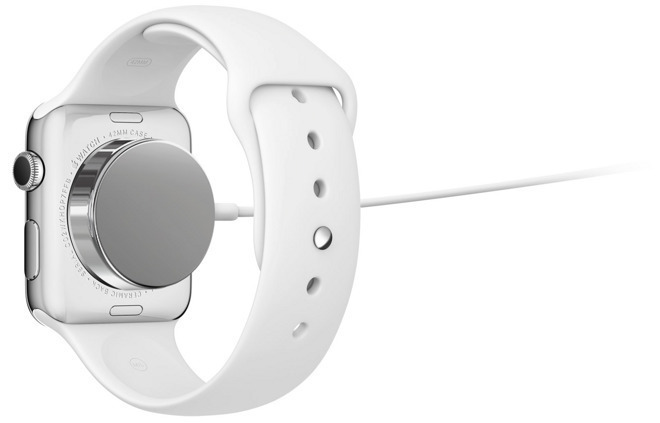 Apple released its first inductive charging solution with Apple Watch and the Magnetic Charging Cable, a magnetic puck that draws energy from a USB power source. As with other wireless technologies, however, the system implemented with Apple Watch is relatively low-power and slow to charge. Though Apple has not revealed future plans, evidence suggests the company is working on powerful technology that could enable long-distance charging. Beyond its own patents for inductive charging systems, the company recently hired two experts from uBeam, a firm developing technology that uses ultrasonic waves to charge devices from afar. Most recently, reports in September implied Apple is on the hunt for manufacturers who can supply wireless charging capable of high energy applications like iPhone. Along with a potential wireless charging solution, the so-called "iPhone 8" is rumored to incorporate a "glass sandwich" chassis with edge-to-edge AMOLED display.